Apple and Intel appear to have dueled over ownership of the Thunderbolt trademark for “dual protocol I/O [input/output] technology,” i.e., some combination of port, connector, cable and underlying technology (not to be confused with this Thunderbolt – application here – which Apple is set to oppose). Reportedly, Intel had technology by the name of “Intel Light Peak” and was approached in 2009 by Apple to modify it, with the result being the current Thunderbolt technology. 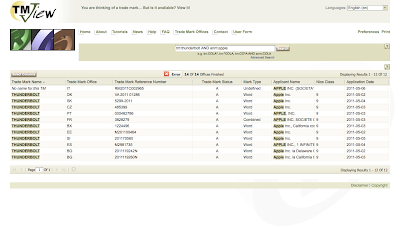 It also lists the Thunderbolt on its Trademark page as one of its trademarks, but Intel does not appear to have filed its own applications. But mostly what this story shows is that even the most sophisticated parties with presumably well-thought out agreements can still flub it (or else couldn’t agree). 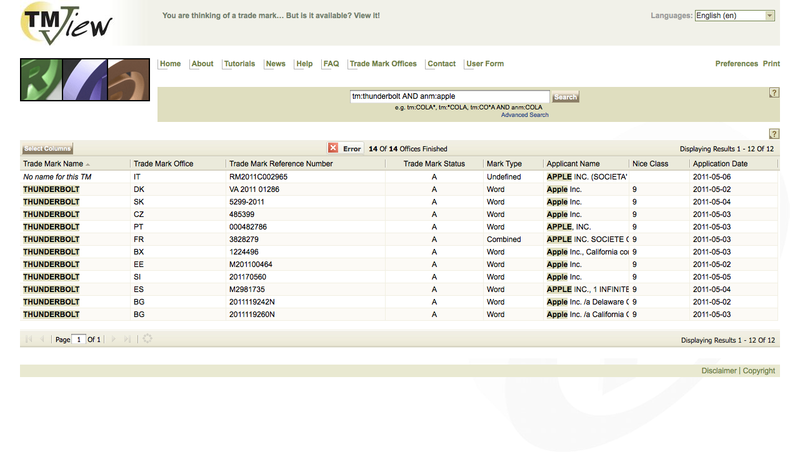 It appears that in a joint development situation, presumably covered by a formal agreement, no one thought about who would own the trademark name for the new technology. The land was up for grabs and Apple was the first to the high ground, filing its first application off the radar in Jamaica well before any public announcement. News reporting here, here, here, here, here, here, here, here and here.